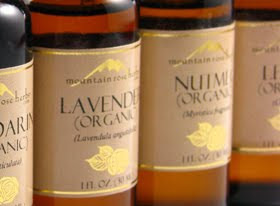 Essential Oils are highly concentrated distilled plant essences. Many essential oils have anti-viral and immune-modulating properties. The antiviral action of certain essential oils is one of their most valuable attributes-especially since allopathic medicine has little to offer. Essential oils with terpenoid compounds are very specific, notably the citruses and pine oils, as well as some oils in the phenol group. Lavender, lemon, bergamot, thyme, chamomile, pine, sandalwood, myrrh and vetiver stimulate production of infection-fighting white corpuscles. Lavender, lemon, marjoram, frankincense, eucalyptus, melaleuca (Tea Tree Oil) and rosemary. The following blend helps build the body's natural resistance. Use as a body oil daily in the bath as part of a health-maintenance program, or to treat acute conditions such as cold or flu. Try adding some to a small spray bottle diluted with spring water. Carry with you to disinfect surfaces in public places or disinifect the air. Eucalyptus, Rosemary, Cinnamon, Clove and Lemon. Mix with base of olive oil. Put a tablespoon of each in a 2 oz. bottle and then fill the rest with olive oil. You can make a larger batch in a quart jar following the same proportion method. Diffuse for short periods of time (1/2 hour or less) in the work or home environment. Apply to the bottom of the feet or dilute with a massage oil base for a stimulating massage under the arms and on the chest at the base of the neck.